Toyota Transportation Research Institute was established as a incorporated foundation in 1991 through cooperation between the public and private sectors. 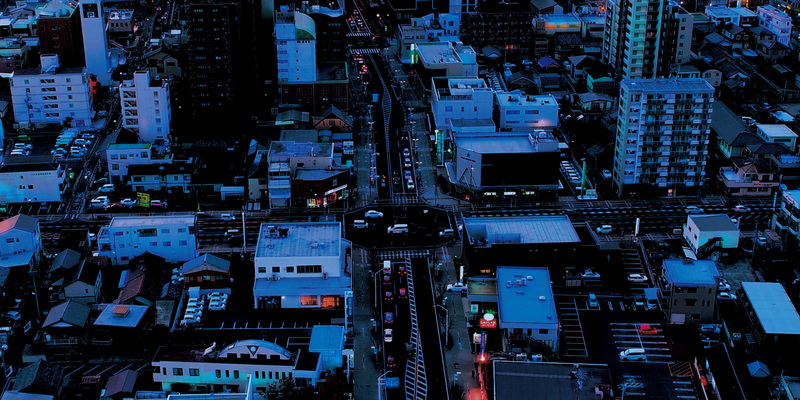 It is a unique research institute in Japan that conducts study and research into "urban traffic and transportation". Since its establishment, our institute has conducted practical research in light of the local characteristics of Toyota City, a local city, and has made recommendations such as the "Toyota City Urban Transport Vision". In addition, the outcomes of the Institute's practical research are disseminated widely in Japan and abroad. Our institute upholds the "promotion of transportation-based community development" as one of its missions. We consider transportation as an essential element to support people's social lives and think that planning and policy development regarding it must be worked on jointly with "community development". Bearing in mind the above, we work relentlessly on our research with a view to promoting "transportation-based community development" where we work to achieve "community development" from the viewpoint of transport, and to contributing to the realization of environment for movement that guarantees rich social lives for people. 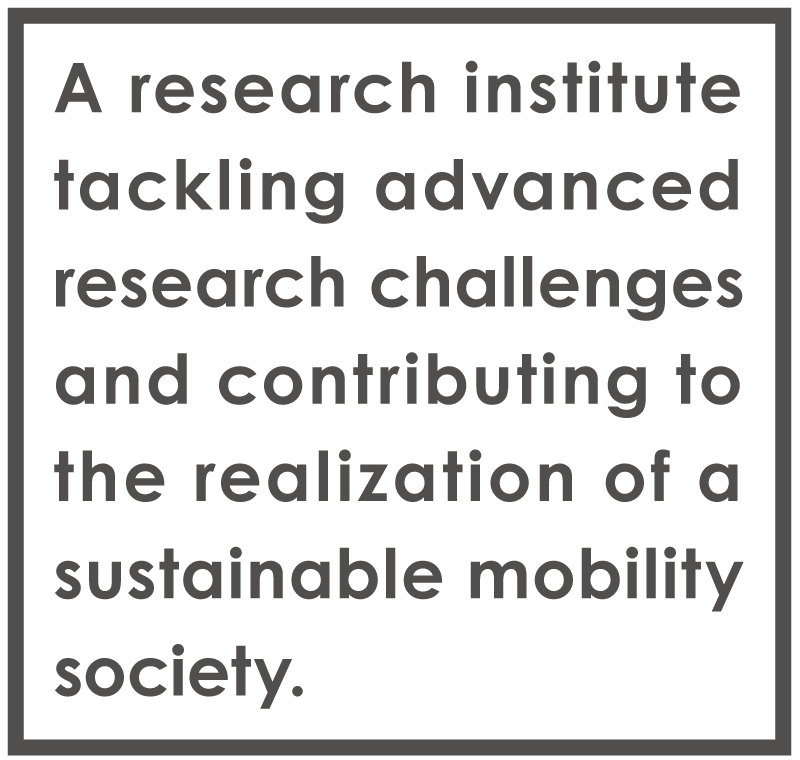 Our institute contributes to the realization of a sustainable mobility society through the accumulation of practical research that contributes to promoting transportation-based community development, in light of the needs for the research and its social importance. In setting our research theme, we have set two "directions" bearing in mind the social background that needs to be taken into consideration, such as the super-aging and depopulation of society. 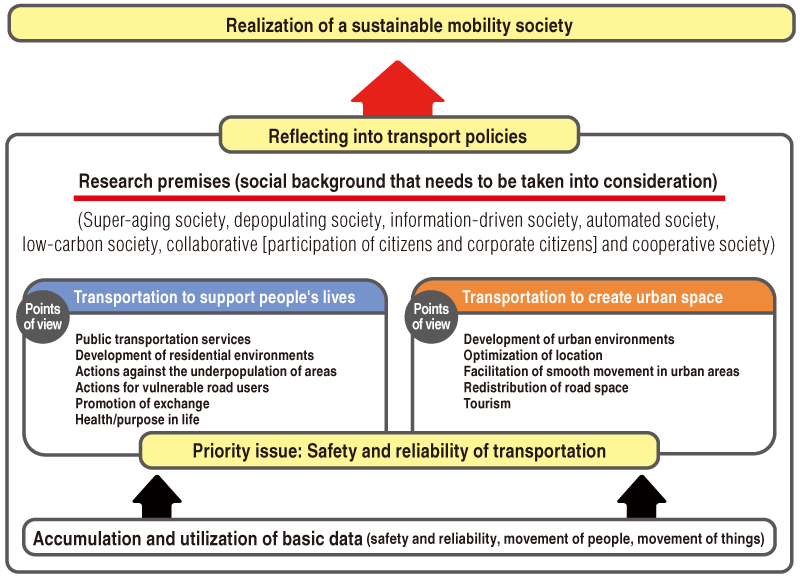 These two directions are: "transportation to support people's lives", from the viewpoint that transportation supports people's social activity; and "transportation to create urban space", from the viewpoint of sustainable urban management. These directions include a wide range of "points of view", and "transportation to support people's lives" includes public transportation services, the development of residential environments and action against the underpopulation of areas, while "transportation to create urban space" includes the development of urban environments, optimization of locations, and facilitation of smooth movement in urban areas. Moreover, "safety and reliability of transportation" is regarded as a top-priority issue in both directions. We work on research, having set specific themes on the basis of these "directions" and "points of view". 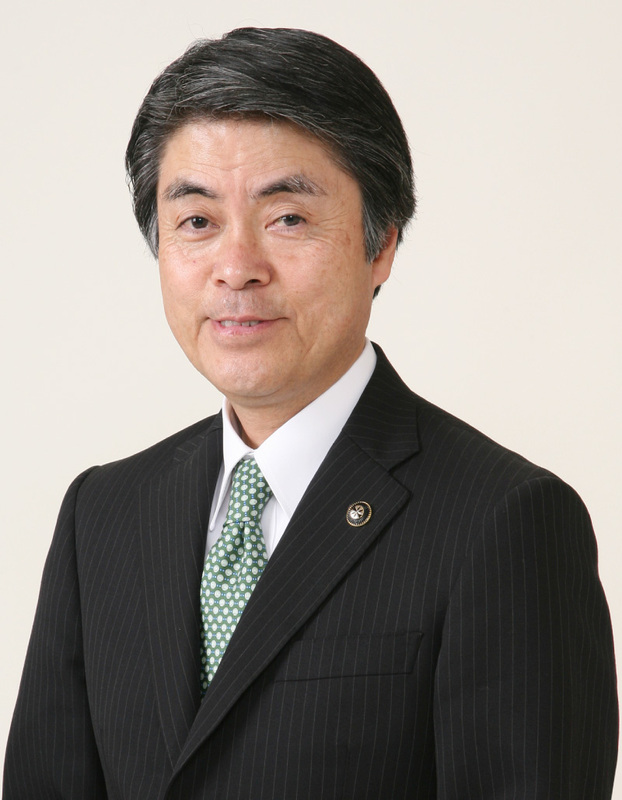 Toyota Transportation Research Institute was established as a non-profit incorporated foundation in March 1991 jointly by the public sector and the private sector to serve as an organization conducting "practical" study and research on "urban traffic and transportation". Our institute was authorized as a public interest incorporated foundation in April 2010 to better achieve its general public interest role and develop the efficiency of its management. Our institute is conducting its activities in pursuit of its three roles/mission: (1) research on urban transportation in the broadest sense; (2) promotion of transportation-based community development; and (3) dissemination of information and contributing to the world. In its study and research, our institute is working on research in the two directions of "transportation to support people's lives" and "transportation to create urban space" with the top-priority issue of "safety and reliability of transportation", taking into consideration the social background such as the super-aging of society and the declining population. Furthermore, our institute makes proposals on the grounds of these research outcomes so that they may play a useful role in the transport policies of the region. Transportation is the basis for human activity. Amidst the rapid changes in our social environment and technological innovations, requirements for transportation are diversifying, and our Institute is expected to play an ever-growing role. We will continue to deepen our research on the basis of an accurate understanding of social needs, and contribute to the realization of sustainable urban transportation that offers people an affluent life. COPYRIGHT(C) TTRI ALL RIGHT RESERVED.